The Establishing Shot: See the entire Live-Action Halo 4: Forward Unto Dawn Series here! 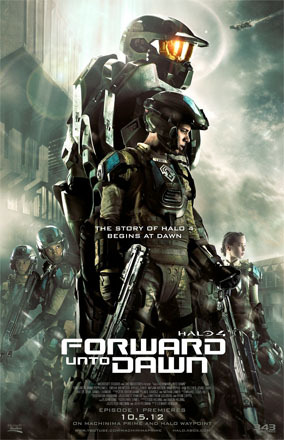 See the entire Live-Action Halo 4: Forward Unto Dawn Series here! Earlier this week I posted about Guy Ritchie's fun trailer for Call of Duty: Black Ops 2 but something else has been happening over the last couple of weeks that is heating up the long standing rivalry between two of the biggest selling console games of all time. In the run up to Christmas not only did Microsoft Game Studios bring in David Fincher to produce their Halo 4 Scanned trailer directed by Special Effects wiz Tim Miller but Halo also brought out a live action web series Halo 4: Forward Unto Dawn which is pretty great introduction to Halo 4 and the return of Master Chief after a 4 year absence. You can view both the full 2:22 version of David Fincher - Tim Miller Halo 4 Scanned advert below but the entire 5 part Halo 4: Forward Unto Dawn web series starring Anna Popplewell from the Narnia series. Hastati Squad, the newest batch of freshman cadets at the UNSC's Corbulo Academy of Military Science, pays the price for cadet Thomas Lasky's tactics. Cadet Michael "Sully" Sullivan continues to decode the hidden ONI combat video as Lasky's struggle with his place in the UNSC ignites with fellow cadet Walter Vickers. After a classroom confrontation with Captain Mehaffey and a challenge from Chyler, Lasky pulls Hastati Squad back from the brink...at a terrible physical cost to himself. While Corbulo Academy is being destroyed by the Covenant invasion, the surviving cadets fight bravely alongside their only hope: The Master Chief. After a terrifying night of combat and loss, Lasky makes a life-or-death decision to help the Master Chief... but will it be enough to save them all from the Covenant? A special extended cut of Halo 4: Forward Unto Dawn will come with the Halo 4 Limited Edition in the form of a download code. A Blu-ray and DVD release is planned for December 4 with the following bonus content. Halo 4: Watch the official Halo 4 Launch Trailer, Scanned. Master Chief's mind is violated by a powerful new enemy, who in searching for Chief's weaknesses, finds the source of his strength. Winner of over 30 industry awards.